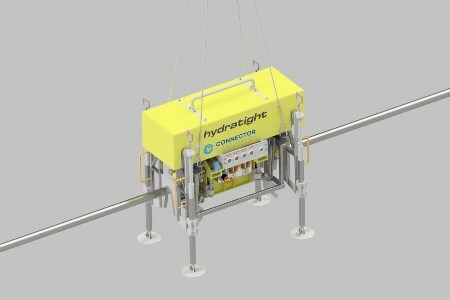 UK-based subsea connector specialist, Hydratight, and Norwegian technologist, Connector Subsea Solutions (CSS), have completed a milestone deepwater pipeline repair in Western Australia. A 4 in. pipeline that was pressure rated to 400 bar and was located at 830 m required urgent repair. Due to its pressure and location, the pipeline required a customised solution. Therefore, Hydratight and CSS designed, manufactured and installed a diverless structural deepwater pipeline repair clamp for the project. Prior to installation of the clamp, the companies also prepared the pipe using a new, high performance ROV-based coating removal tool. After successful testing and real life completion of the project, the companies can now offer similar services worldwide to increase the lifespan of subsea installations. The clamps are DNV-approved and will last up to 25 years in service. The clamp has been designed without the use of bolt tensioning to activate. All activation technologies and hydraulics are in an external installation tool, which is removed on completion. This significantly reduces the overall weight of the equipment left as a permanent repair on the pipe, lowering project time and costs.